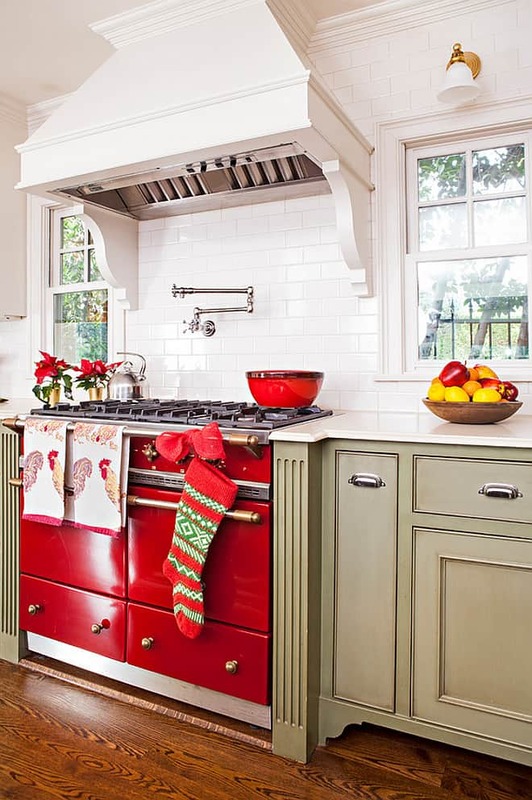 Decorating your kitchen for the holiday season can be incredibly stressful — especially when you’re spending all your time in there already, cooking and cleaning for all those out-of-town guests! 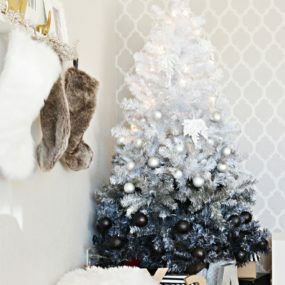 But, we’re going to show you some really refreshing ways to organize and refresh your space with a little holiday spirit. 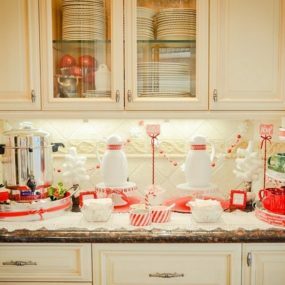 You don’t need to completely gut your kitchen (you probably already did that once on a turkey), so we are keeping it sweet and completely do-able during the madness that occurs during the end of the year celebrations! 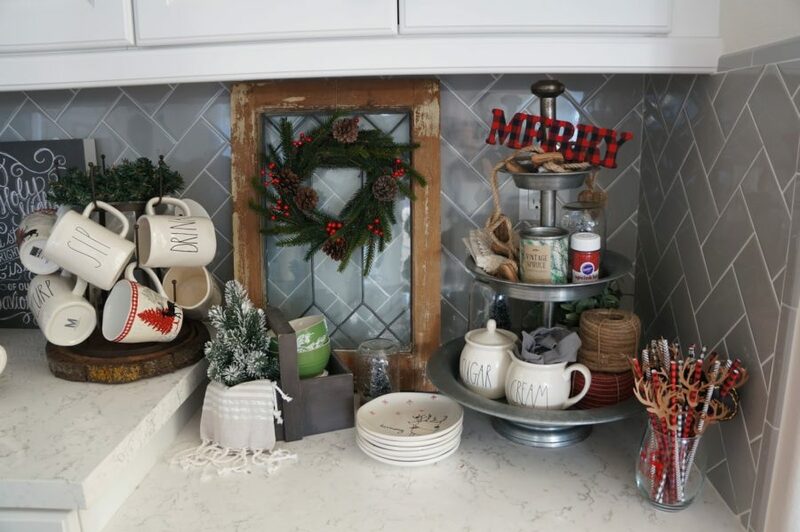 Setting out a little tray for coffee and tea is one of the easiest and sweetest things you can do to keep your kitchen feeling festive! 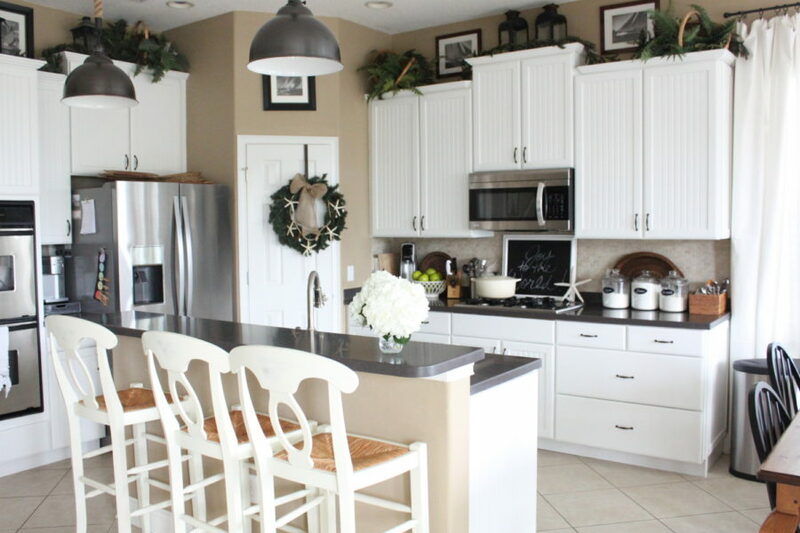 Not all of us have all-white kitchens, but don’t let that stop you! 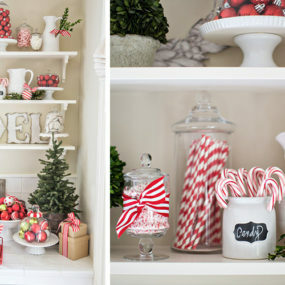 Gather up your candy canes and place them in transparent jars, or in the coffee mugs themselves, as stir sticks. 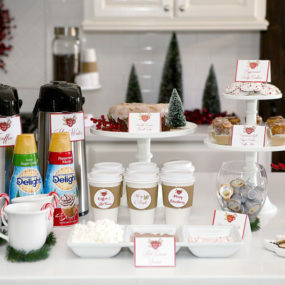 You can even put your extra ornaments in beautiful white bowls on shelves to add a little extra spirit to your own personalized coffee corner. 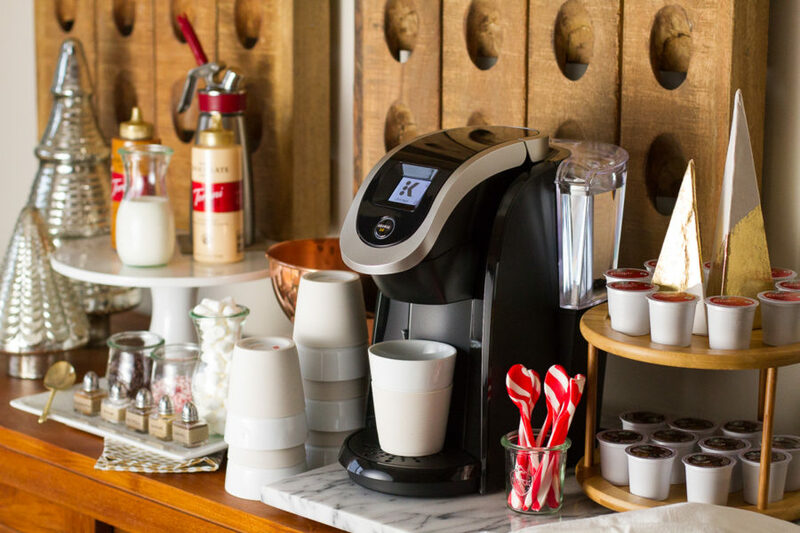 If you have guests traveling a long way back home after the holidays, you can even think to introduce the to-go cups to your bar! 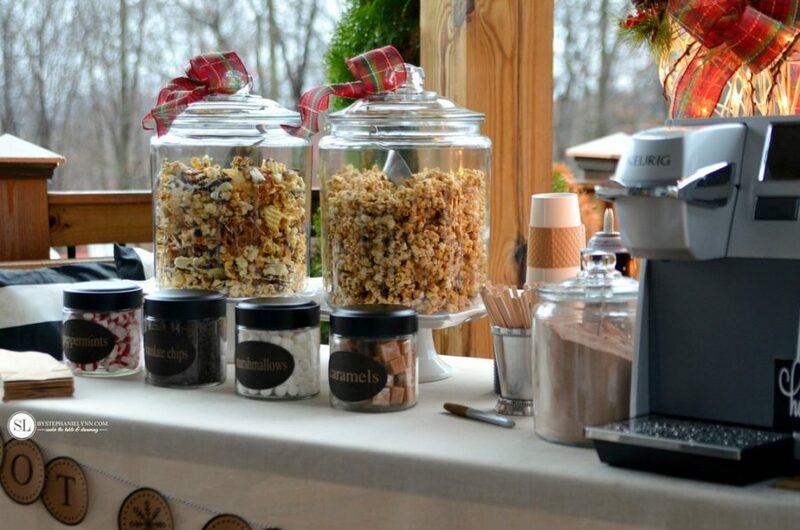 -I’m sure your guests would greatly appreciate a hot pick-me-up for the road, and maybe even a few extra cookies if you can spare. 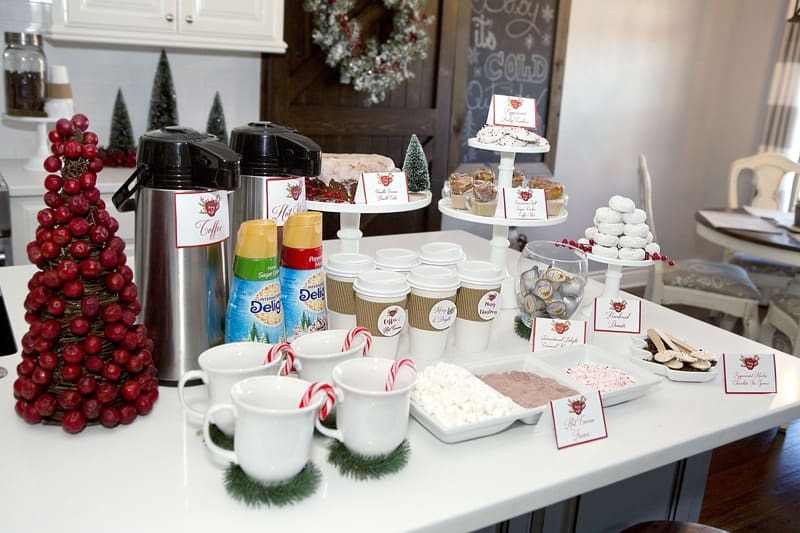 Sipping on something warm during the chilly holiday weather makes this little hot cocoa buffet the perfect addition to your home. 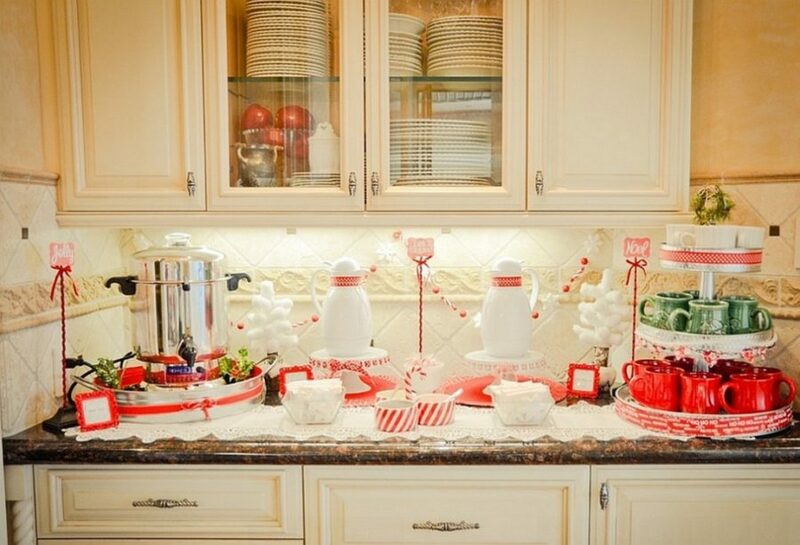 If you have the extra counter space, move your coffee pot to that corner along with the hot cocoa, and be sure to put all the fixin’s in little glass bowls. 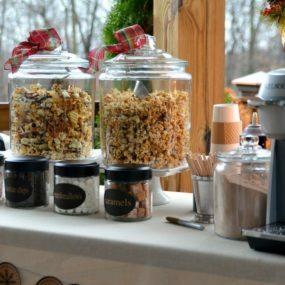 Guests can help themselves while everyone is running around and you’ll feel all warm inside knowing everyone has something sweet (or highly caffeinated) to sip on. 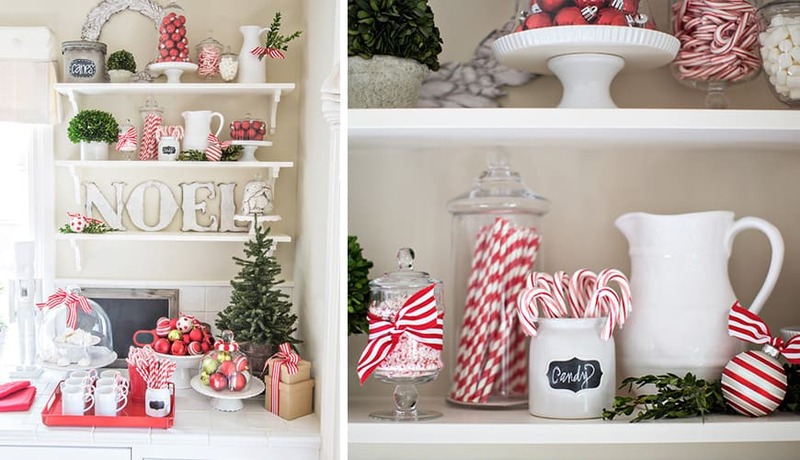 If you have extra jars or cake stands in your cupboards, they make great decorative pieces in your kitchen -especially if you fill them with marshmallows, candy canes, and ornaments! 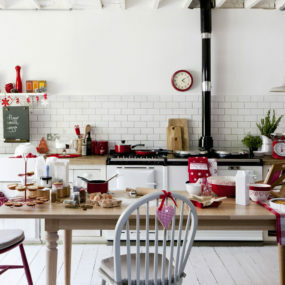 Adding ribbon is also a really simple and beautiful example of how you can put some extra touches on the decorations in your kitchen. 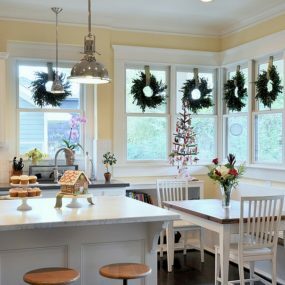 If you’re late on your decorating game this holiday season, then take a look at the photo above for some very simple, but cheery little things you can add to your kitchen! 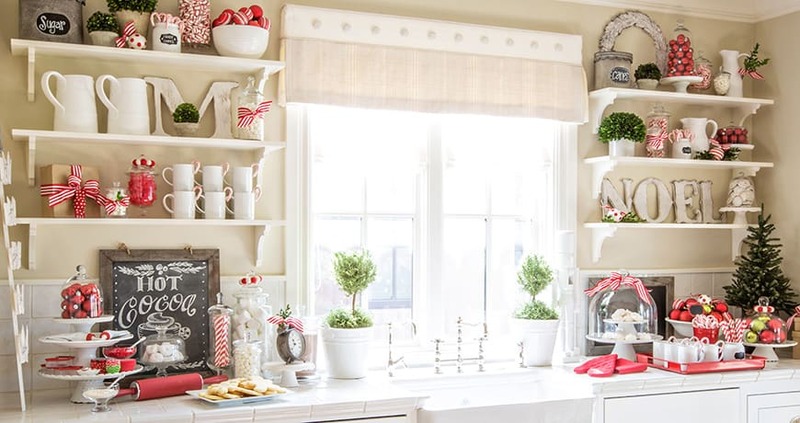 Wreaths are easy to hang, and they don’t necessarily have to be green, either! 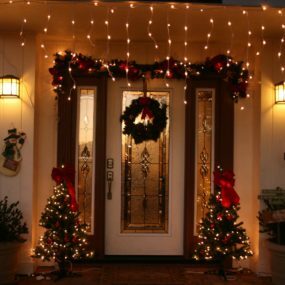 You can choose a red wreath, or a wreath of lights -the options are really endless. And the places you can hang them are endless, too! 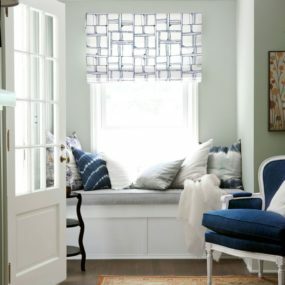 Think: over the back of chairs, on a couple windows or all your windows like the photo above. 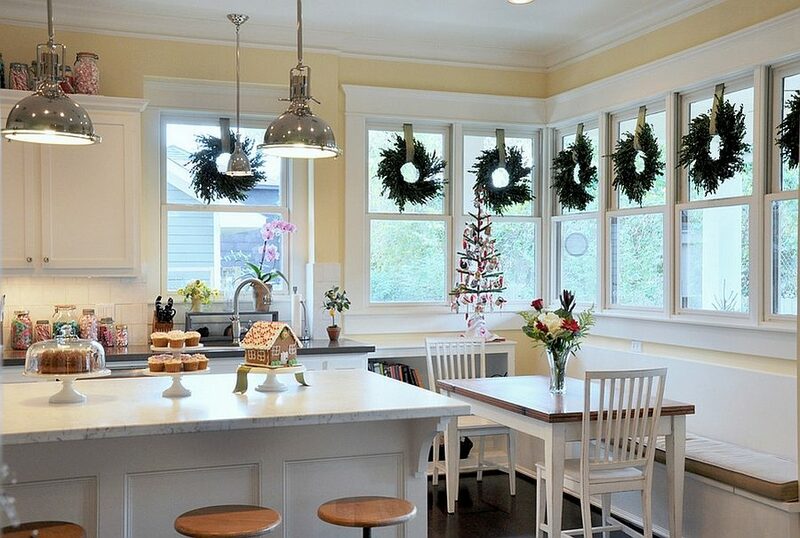 You can tie mini wreaths to your light fixture so they will dangle above the kitchen table, even! 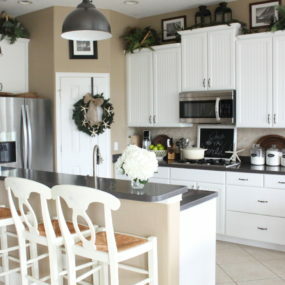 Not every kitchen is neutral, so the photo below is a terrific example of how to complement any colors you might have. 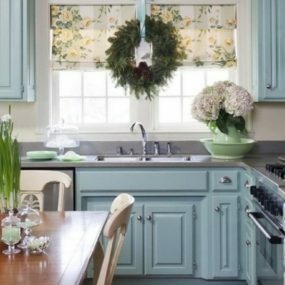 If your kitchen is blue or red or orange or any combination of colors, then get back to the basics and pick up some greenery. Living plants and even a fruit bowl can add wonders to an already vibrant atmosphere. If you’re on the coast, then keep the sea-vibes you love so much. Take some seashells or starfish and wrap them around a wreath or two with some twine and burlap ribbon. 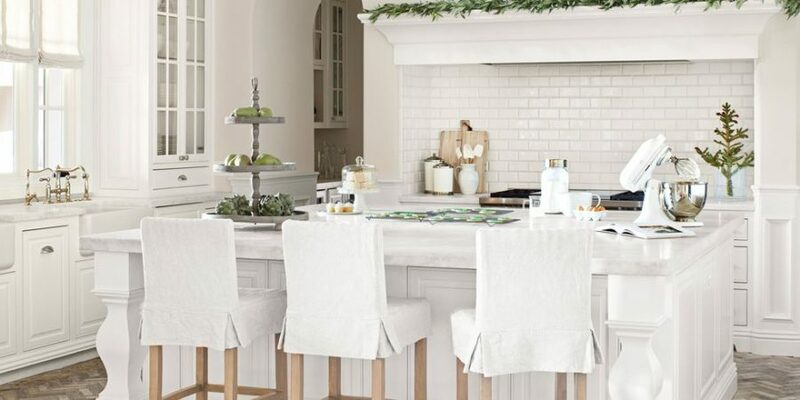 Also, using greenery on the top of your cabinets is a really elegant way to add some winter-y tones without getting too far away from the coastal beach theme. 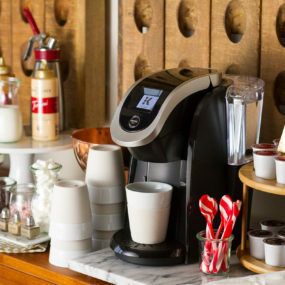 Don’t be afraid to add a sleigh to the mix. Yes, that’s right! 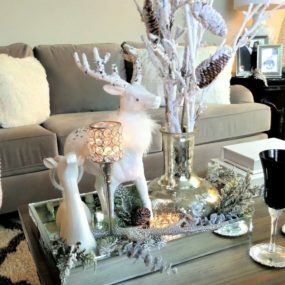 Whatever fun pieces you have that create a winter wonderland indoors, can be hung in the window for fun. 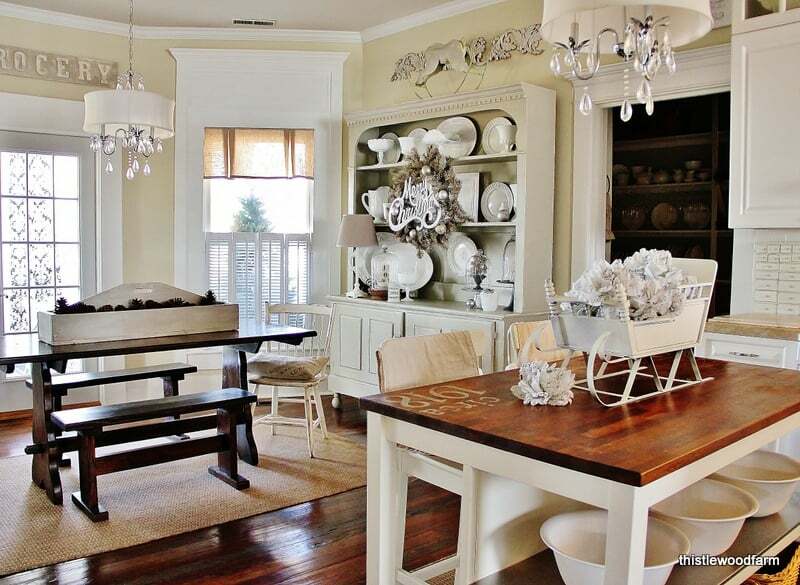 Again, just add some greenery to tie it all together and voila! 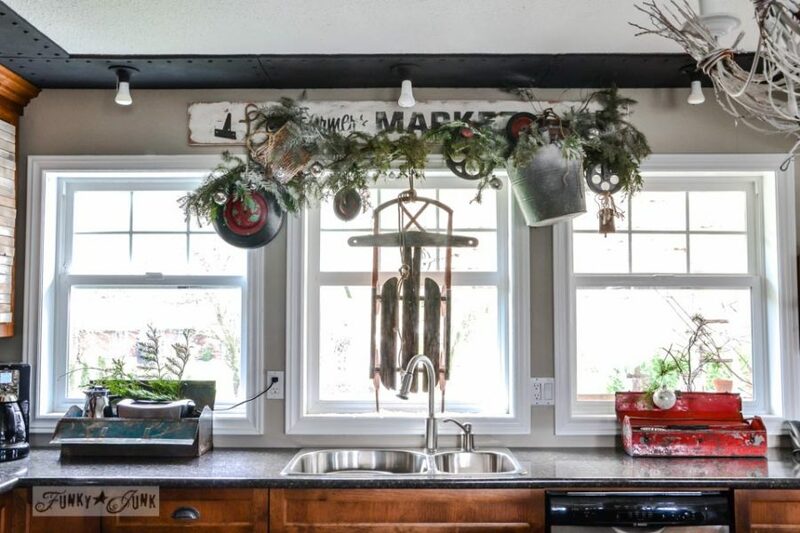 You’ve got an extremely eclectic and one-of-a-kind decoration for your kitchen. Poinsettias! Miniature poinsettias! 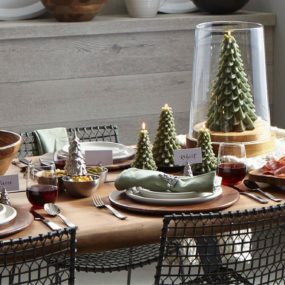 How perfect for the holiday season. 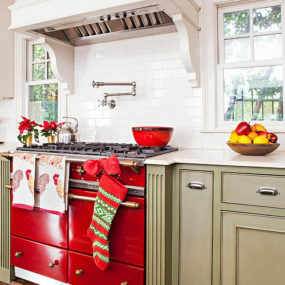 They add life, a nice, merry color, and can be moved anywhere out of the way when the kids are rolling out that dough for Santa’s sugar cookies! It doesn’t get simpler than picking up a plant or two from your local grocery store! 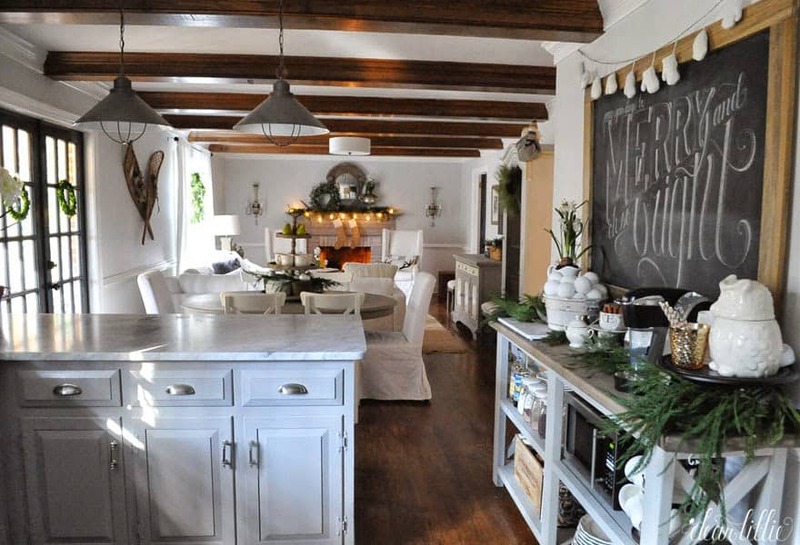 Take advantage of that chalk board you have somewhere else in the house! 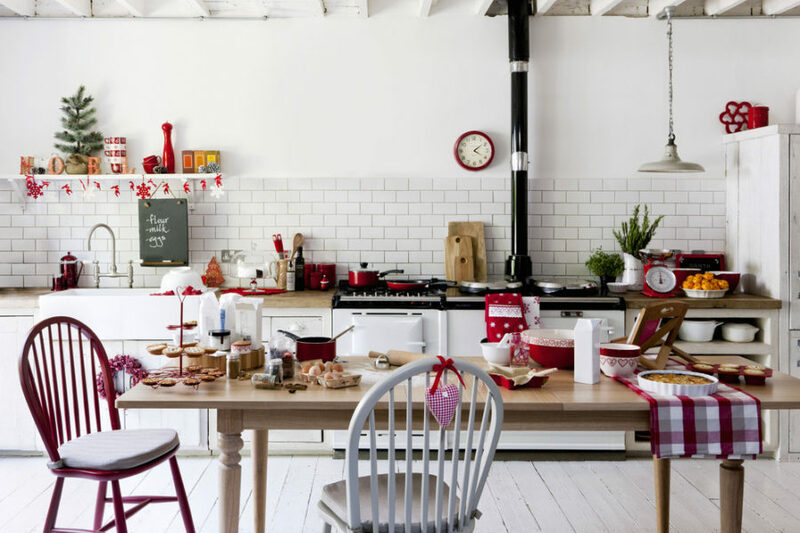 Move it to the kitchen as a beautiful and inviting focal point and write a merry message on it to welcome your out-of-town guests! 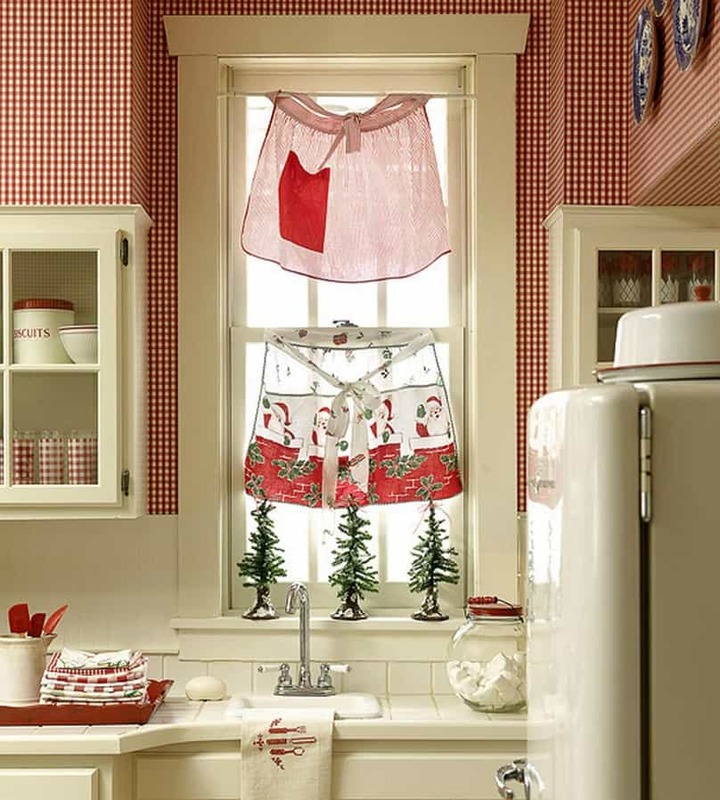 Re-purpose some old aprons into sweet little kitchen curtains and pick up some red and green tea towels from the store. 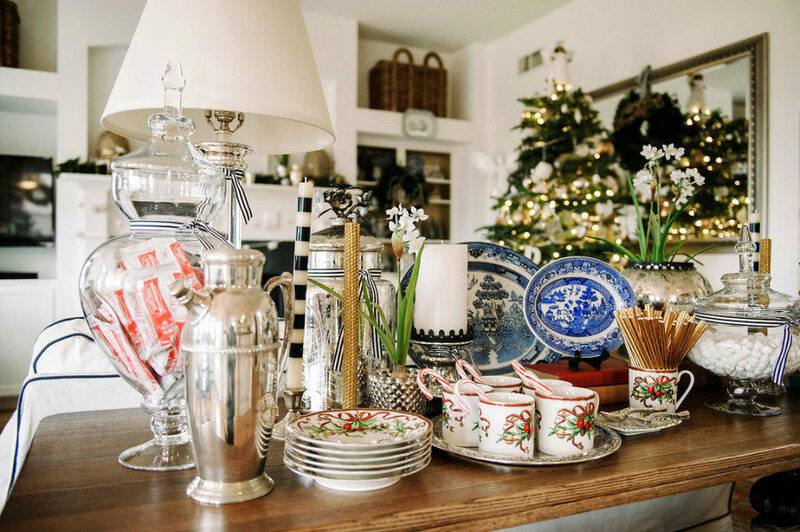 A trip to an antique store could be a great way to pick up some really unique and timeless items for your holiday decorations. If you can’t make it to one of those, then take the example of aprons and expand on them. 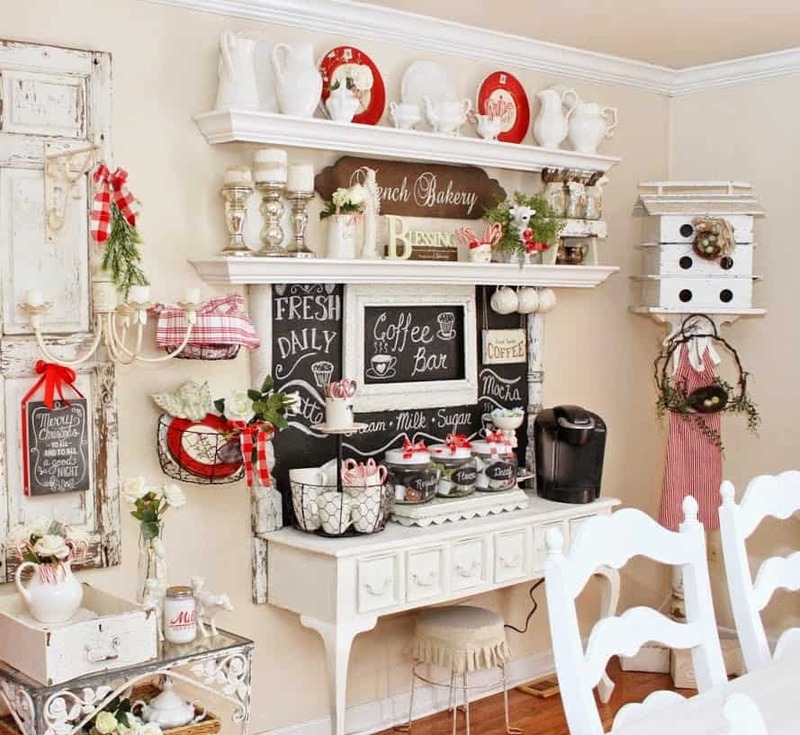 Think about hanging a row of your favorite ornaments or stringing lights across the window. 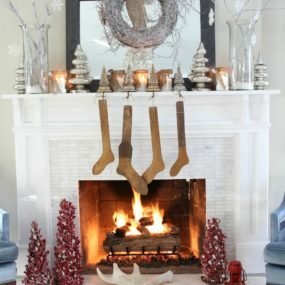 -Anything that makes you feel cozy and in the holiday spirit will do! 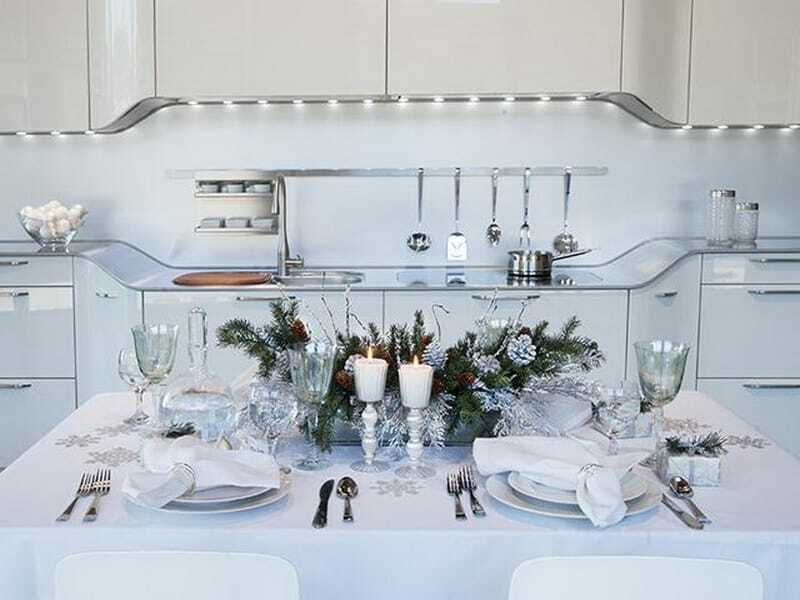 White and silver is as classy as it gets with Christmas decor. 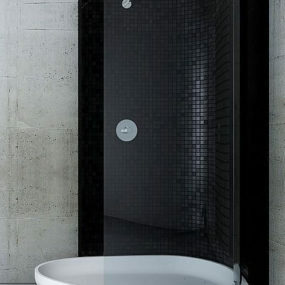 When you stick with a very simple color scheme, you can combine any and all textures, styles and sizes. Have an old latter around your house? It doesn’t even have to be wood. Just find one that you can clean up and little bit and hang your old quilts and blankets on them for some cozy additions to any space! 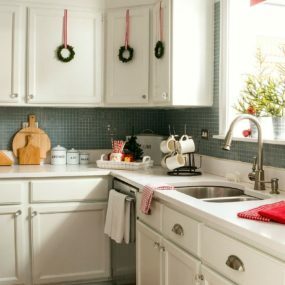 Also think about wrapping a wreath around the lights in your kitchen. You can make it as intricate or simple as you’d prefer. Remember the snowflake cut-outs you used to make as a kid? Well, take advantage of this time of year and the excuse for needing decorations and cut some snowflakes! 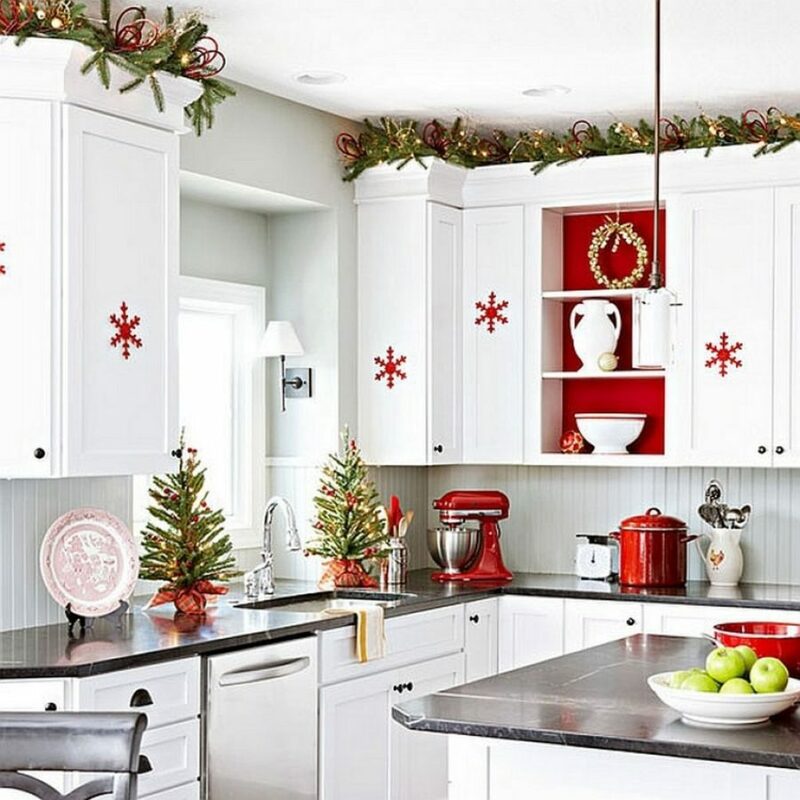 You can use red construction paper to make a bold statement or you can keep the traditional white strings of flakes and tape them along the bottoms of the cabinets!